I'm pretty sure I have this piece in my collection, probably from a Bohrok. At that time, I think I might have dismissed it as not a LEGO piece and I might have tossed it. Turns out, it is. I'm pretty sure this piece wasn't mentioned in the instructions booklet itself. Within this Bohrok set, what is it used for? And how is it used in other sets? 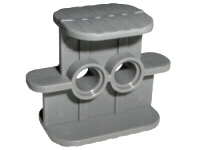 Bricklink lists this as a belt/rubber band holder, but I'm not quite sure how it can be used as such. Fikko, it is not a regular part. It is simply a piece of plastic for holding the rubber bands that came in sets to make sure they are visible enough and won't get lost in the packaging. And you could also use them to store your rubber bands so they won't get lost. These days LEGO uses a little paper-sleeve for rubber-bands, string, etc., however before 2008 the piece you meantioned was used in sets with rubber bands. There is also a larger version for bigger rubber-bands. Even though it is not a regular LEGO element I have seen LEGO creations that incorporates the piece in creative ways; usually as a face for a robot or statue because of those holes that look like eyes. Fikko3107 is correct, it is in fact a LEGO rubber band holder, for storing two different sizes of rubber bands. It's purpose insofar as the Bohrok sets are concerned, I'm afraid I don't know enough about Bionicle to give you an answer. Perhaps the instruction booklet may offer some clues? As masterX244 stated, it is unofficially known as the 'nnenn' element, so named after Nate 'nnenn' Nielsen, who was a talented and prolific builder who used it as his Flickr avatar and who caused quite a stir among the LEGO community by using cut, painted and modified elements from clone brands as well as official LEGO parts. His build were so good, and so numerous, that despite offending purists and building brilliantly in a range of scales, he very rapidly became known as one of the better builders among the community - unfortunately, he was taken too soon from us all in a car accident and we will never see any new creations from this remarkable man, mentor, husband and father. He was also responsible for creating NoVVember (flickr.com/groups/921332@N22/pool/with/5203643999/), a month dedicated to starfighter builds based on the Vic Viper craft from the Gradius Series arcade shoot-em-up games (en.wikipedia.org/wiki/Vic_Viper). 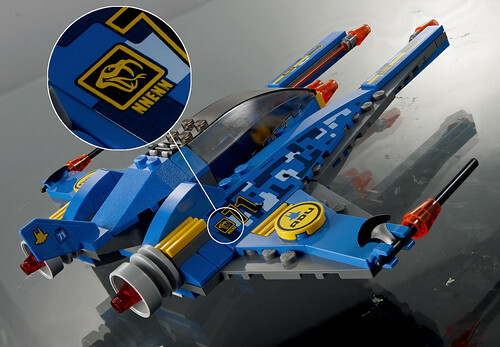 LEGO (through the influence of set designer Mark Stafford) paid homage to his contribution to the hobby and the community by including his name on the Vic Viper inspired spacecraft that sits on the back of 7066: Earth Defense HQ (brickset.com/detail/?Set=7066-1). Thanks for contributing an answer to Bricks! Not the answer you're looking for? Browse other questions tagged piece-information or ask your own question. Where are the cloth / fabric minifigure capes / cloaks in my set? Is there a modern equivalent for windscreen piece 6152? What is this piece? Ring with studs, anyone have a clue for part #? Where is this piece in LDD? Where can I find this piece in LDD V4.3.11? Why is this piece notched? What is this old dark grey lego piece? What happened to Thoros of Myr's flaming sword? Can you explain what "processes and tools" means in the first Agile principle? Is it possible to give , in economics, an example of a relation ( set of ordered pairs) that is not a function?